Discussion in 'If I Ran The Park...' started by SFNEKid15, Jul 28, 2012. Disclaimer: I'm only making up what I want/think the plans for the park will be in the next few years. I don't know what any names for any new attractions will be, and if I happen to get a ride attraction or name right, just call me psychic. Well, it appears that Six Flags New England will be getting a Star Flyer in Dare Devil Dive's spot, so I'll base 2013 off of that. The park will only see one addition in the attraction side of things, but it will still be a big year for the park. This all starts with destroying Dare Devil Dive. They will not relocate it, and will put both the queue and Star Flyer on the current hill that Dare Devil Dive sits upon. The ride will not receive a flash pass option, but will receive a single rider line to fill in empty seats. The ride will be called "The Watch Tower" with a red and white color scheme, and a minimal queue theme. The line will have a canopy with misters, similar to Batman's queue. Aside from the new attraction, the area surrounding "The Watch Tower" will have a total landscape makeover, with new plants, flowers, and grass along the side of the cliff, and along the queue and ride. 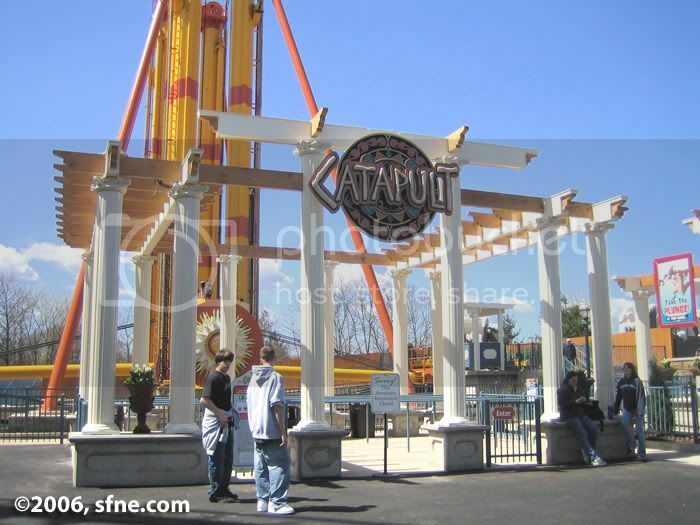 The queue cover structure for Catapult will be repainted white, so that it looks like this. It will also receive a flat roof to cover guests from the whether. The poles on the sides of the staircase and walkways next to Catapult, Watch Tower, and Cyclone will be repainted red, to go with the colors of "The Watch Tower". -Addition of Star Flyer, "The Watch Tower". -Removal of Dare Devil Dive. -Landscape renovations to the area surrounding "The Watch Tower". I think that everything about that is cool. I would just add a lighthouse to the top of the star flyer, then it would make more sense for the ride to be called The Watch Tower. I also think the colors would be great. I think navy blue and white would be better though. I'm still all for the lighthouse theme, but if we just get the standard clock on top, "the watch tower" still works for the naming, and reminds me of London and Big Ben, with the obvious connection to the architecture and resemblance of many New England cities/towns. So really I think either way works. For 2013, Six Flags New England will create a unique, yet simple show for teens and adults. It will be called, "Remember The Lyrics". The show will be a spin off of the current show "Don't Forget The Lyrics". It will be good for the park's season pass holders, because the show will feature an array of different songs, so not every show will be the same songs, or the same outcome. In order to win, the contestant (who will be picked from the crowd), will have to get 3 songs correct, each song will feature 3 missing lines, and if the contestant gets all the way through without losing, they will receive a skip the line pass for 4 persons. The show will run from Memorial Day to Labor Day. This show will take place in the Rockville Theater. I will edit this post tomorrow some time, to update the list of shows for 2013. Stay tuned. Sort of like "The Singing Bee" - I like it! No one knew it was going to be removed when this topic was first created 11 months ago. If it's Going to be the Watch Tower and have a clock, then they should put some bells in the clock ,as long as vibration won't be a issue, that way they could let people know what the time is, and folks could set their watch by the time it would show. ^Don't double post, just edit the first post if you want to add something. I would love to see a light house on the top of the tower, but I have a feeling that it's going to be the same crown as the on at Six Flags Over Texas. Sushi would be Something new and different! It's an interesting idea. but I see far more people at Market basic getting subs and pizza form the market kitchen then sushi. Something at unique as this should be put into a servery to gauge interest before dedicating space to it. The beacon would have been a cool idea!